Voice of the Artist: Going Once, Going Twice... SOLD!! Going Once, Going Twice... SOLD!! Last night Christie’s New York hosted the highest-grossing auction ever with a fall postwar and contemporary art evening sale that brought in $691.6 million and included a new all-time high for a publicly traded artwork, Three Studies of Lucian Freud by Francis Bacon (1969), which sold for $142.4 million with premium to Acquavella Galleries. 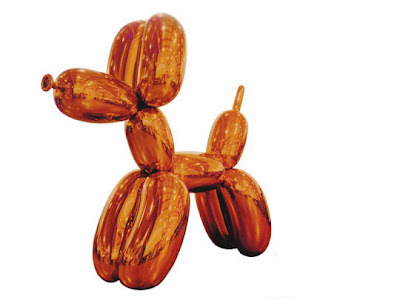 The two-hour auction also saw Jeff Koons become the world’s most expensive artist with the sale of Balloon Dog (Orange) (1994–2000) for $58.4 million, the second-most-expensive lot of the evening, which included eight other artist records, for Wade Guyton, Christopher Wool, Vija Celmins, Lucio Fontana, Ad Reinhardt, Donald Judd, Willem de Kooning and Wayne Thiebaud. “Where should we open this?” the English-accented Mr. Pylkkänen mused from the rostrum at the start of the Bacon lot. The estimates for the piece had not been officially disclosed before the sale and he seemed to relish in disclosing the ultimate low estimate: “Eight-ty million dollars. Eighty million dollars.” Hong Gyu Shin, the young director of the fairly unknown New York-based Shin Gallery, bid the painting up to $100 million from a corner of the room, battling with standing orders for bids in Mr. Pylkkänen book. “I’m out at $100 million,” Mr. Pylkkänen said. Larry Gagosian tried to offer $101 million. “Give me five, sir,” Mr. Pylkkänen said. Mr. Gagosian offered it, but then was soon out at $110 million from Mr. Shin. “Thank you for your attempt at bidding,” Mr. Pylkkänen said, without malice. Soon Mr. Shin was at $124 million, thanks to the phone bidders. “I really loved it,” Mr. Shin said of the painting, which was nowhere near as iconic as the previous record holder, Edvard Munch’s The Scream (a version of which sold for $119.9 million at Sotheby’s New York in May 2012), as he left the sale. One could only guess at the source of his funds, but he said he had hoped to buy it for his personal collection and was drawn to the “composition,” the “thumbprints” in the work, the “yellowish color,” the “green foreground” and the “brushstrokes” (each element, possibly, valued at around $25 million). David Zwirner, who has been doing more and more business with Mr. Koons—he staged a Koons show at his gallery this past spring and bought a lower-end Koons at last night’s Phillips sale—jumped in at $39 million, speaking for a client on his cellphone and going slowly back and forth with a phone bidder up to its final price. What Mr. Zwirner will ultimately gain from his bidding will never be known, be it that “financial fee” or another show with the artist; you can see how the numbers get murky. In the press conference after the auction, Christie’s head of postwar and contemporary art Brett Gorvy said he was pleased to see the public interact with the sculpture through “selfies” and “Instagram images” during the brief period in which Balloon Dog was installed at Christie’s before the sale, where it was sold to an “International Trade” group, according to Christie’s press materials. Mr. Van de Weghe was seated next to hedge funder Dan Loeb during the sale, whose Wool, If You (1992–2005), currently hangs at the Guggenheim. Apocalypse Now‘s seller, according toThe New York Times, was another hedge funder, David Ganek, formerly of the Guggenheim board. Dominique Lévy, who recently split with partner Robert Mnuchin to open her own gallery on the Upper East Side, was another high-profile buyer, and purchased Lucio Fontana’s Concetto Spaziale, La Fine di Dio (1963), the record breaker for the artist at $20.9 million and Willem de Kooning’s September Morn (1958) for $14.7 million, and ducked out just at the end of the night’s third-most-expensive lot, Andy Warhol’s Coca-Cola  (1962), which sold to a phone bidder for $57.2 million. At the press conference, Mr. Gorvy, who had written a number of effusive letters advertising the sale, said it was his last-minute decision to move the Bacon to the ninth lot of the evening from its previous place at lot 32, saying that he did so because he “wanted to see,” or show, “how strong this market really was,” and also to give those who might have bought it an opportunity to spend their money on the lots that previously preceded it. Specialist Francis Outred also praised the Bacon piece at the press conference. “Bacon was one of the few artists of the 20th century who experienced great success while he was alive. It’s not a regular problem we have now, but back then he was making work when many artists of his quality didn’t come to success until later in their careers,” he said. This was the case with Freud, who at the time the work was made “was a relatively unknown artist but then through the last 40 and 50 years has become as important as Bacon,” largely thanks to aggressive buying and selling by Acquavella Galleries (though Mr. Outred didn’t mention this). “What was originally a painting of a friend became a conversation between two masters,” Mr. Outred said. The New York fall sales conclude tomorrow night with Sotheby’s contemporary auction. Additional reporting by Laura Mallonee and Zoë Lescaze. All auction research courtesy of Artnet. Stories about the musings, adventures, inspirations, accomplishments, and passions of artists – all who teach or take classes at Scottsdale Artists’ School.